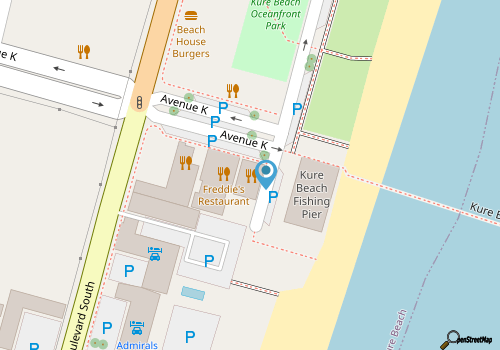 Kure Beach Diner is open for breakfast, lunch, and dinner, and serves up hearty plates in a casual but welcoming environment that boasts a small collection of booths and tables, and sunny lemon-yellow walls. Breakfast fare includes omelets and classic breakfast sandwiches and egg platters, while lunch and dinner patrons will be treated to a big array of sandwiches, starters, cold plates, salads, and seafood specialties that include local favorites including flounder, shrimp and oysters. For something light but ultimately filling, opt for a shrimp or oyster burger, which features fried seafood that’s piled high on a Kaiser roll and is served with French fries. Varied enough to appeal to a crowd of different tastes, this simple but accommodating diner is sure to give patrons plenty of energy to get back to the fishing pier or the beach with gusto. Call (910) 458-8778https://www for current hours.